August is the traditional summer holiday month in Italy, and the Amalfi Coast hits its peak crowding and heat during this time. Everyone seems to be on the beaches, the traffic slows to a crawl, and hotels and restaurants are booked up weeks in advance. August (and July) are the hottest months of the year in southern Italy, though thunderstorms at the end of the month sometimes bring some relief. Pack summer clothing, sandals, hats, and sunscreen. The most important strategy for arranging an August visit to the Amalfi Coast is booking everything well in advance, including hotel stays, boat tours, restaurant tables, and any other tour or experience you are interested in. Everything from accommodations to guided tours book up weeks in advance, particularly on Capri. Avoid touring in the hottest hours of the day, instead scheduling visits and walks early in the morning or late in the afternoon. The most crowded beaches are those that are easy to reach on foot or by car, so opt to spend your day at the quieter spots that are only accessible by sea. There are water taxi and shuttle services from Amalfi and Positano that can take you to a number of nearby coves where there are beach clubs and restaurants in the morning and pick you back up in the evening for just a few euros. 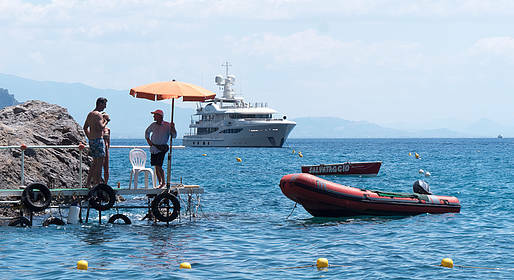 You can catch a boat tour to Capri from a number of towns along the Amalfi Coast. These are small boats that seat up to 30 passengers, a great option for visiting the island in the high season summer months when the ferries are crowded. You can take a similar tour of the Amalfi Coast, with boats that stop at Positano and Amalfi for a quick walk through the center of town. If you would like more privacy and independence, book a boat with skipper all to yourself! Most private boat tours on the Amalfi Coast are by traditional wooden gozzo boat, a type of craft that comes in a number of sizes from the smallest, fitting up to 6 passengers, to the largest that fits up to 12. These boats are perfect for exploring the coast or for heading from Amalfi or Positano to Capri. On 15 August, Positano celebrates the feast day of “Santa Maria Assunta”, the town's patron saint. Fireworks light up the sky above the beaches, and the coastline is crowded with tourists and locals watching the show. Purchase your ticket for an island boat tour online and save! from € 200 Per boat. Up to 10 persons. A 7-hour tour from Positano to Capri: a boat ride around the island plus 4 hours of free time on the island. Choose among Positano.com's selected and reviewed accommodations, with more than 12.000+ dream rooms reserved. The unique flavors of the Amalfi Coast, courtesy of Restaurant M'ama! Traditional Mediterranean hospitality in the heart of Minori. The delicious fish cuisine, typical of the Amalfi Coast. The vicinity to the beach and the sea. The historic residence of the marquis of Villarena, in the center of Nerano. The flavorsome cuisine of the Amalfi Coast served in the Dolce far Niente restaurant. The view of Li Galli from the elegant apartments.